HazardRecognizer - This determines whether or not an instruction can be issued this cycle, and whether or not a noop needs to be inserted to handle the hazard. Definition at line 25 of file ScheduleHazardRecognizer.h. Definition at line 37 of file ScheduleHazardRecognizer.h. Reimplemented in llvm::ScoreboardHazardRecognizer, llvm::GCNHazardRecognizer, llvm::PPCHazardRecognizer970, llvm::HexagonHazardRecognizer, llvm::PPCDispatchGroupSBHazardRecognizer, and llvm::ARMHazardRecognizer. Definition at line 104 of file ScheduleHazardRecognizer.h. FIXME: remove this once MachineScheduler is the only client. Reimplemented in llvm::ScoreboardHazardRecognizer, and llvm::GCNHazardRecognizer. Definition at line 51 of file ScheduleHazardRecognizer.h. Reimplemented in llvm::ScoreboardHazardRecognizer, llvm::SystemZHazardRecognizer, llvm::GCNHazardRecognizer, llvm::PPCHazardRecognizer970, llvm::HexagonHazardRecognizer, llvm::PPCDispatchGroupSBHazardRecognizer, and llvm::ARMHazardRecognizer. Definition at line 71 of file ScheduleHazardRecognizer.h. 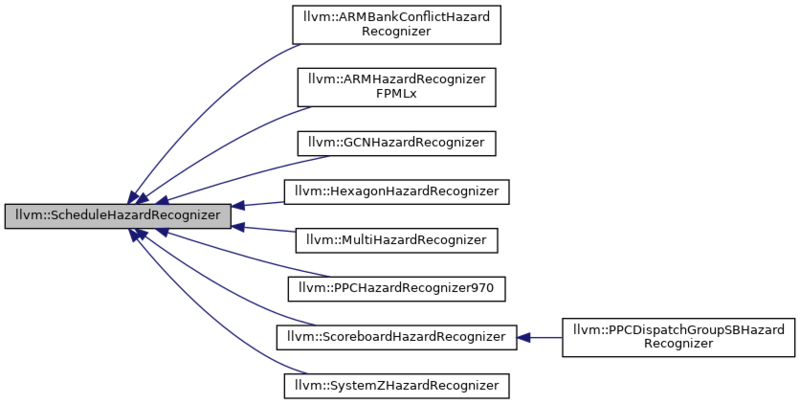 This overload will be used when the hazard recognizer is being used by a non-scheduling pass, which does not use SUnits. Definition at line 75 of file ScheduleHazardRecognizer.h. Reimplemented in llvm::GCNHazardRecognizer, and llvm::PPCDispatchGroupSBHazardRecognizer. Definition at line 113 of file ScheduleHazardRecognizer.h. Reimplemented in llvm::ScoreboardHazardRecognizer, llvm::SystemZHazardRecognizer, llvm::GCNHazardRecognizer, llvm::PPCHazardRecognizer970, llvm::HexagonHazardRecognizer, llvm::ARMHazardRecognizer, and llvm::PPCDispatchGroupSBHazardRecognizer. Definition at line 60 of file ScheduleHazardRecognizer.h. Definition at line 43 of file ScheduleHazardRecognizer.h. Definition at line 45 of file ScheduleHazardRecognizer.h. It should return the number of noops to emit prior to the provided instruction. Note: This is only used during PostRA scheduling. EmitNoop is not called for these noops. Definition at line 82 of file ScheduleHazardRecognizer.h. Definition at line 88 of file ScheduleHazardRecognizer.h. Reimplemented in llvm::ScoreboardHazardRecognizer, llvm::GCNHazardRecognizer, llvm::PPCDispatchGroupSBHazardRecognizer, and llvm::ARMHazardRecognizer. Definition at line 109 of file ScheduleHazardRecognizer.h. Reimplemented in llvm::ScoreboardHazardRecognizer, llvm::SystemZHazardRecognizer, llvm::PPCHazardRecognizer970, llvm::HexagonHazardRecognizer, llvm::PPCDispatchGroupSBHazardRecognizer, and llvm::ARMHazardRecognizer. Definition at line 67 of file ScheduleHazardRecognizer.h. ShouldPreferAnother - This callback may be invoked if getHazardType returns NoHazard. If, even though there is no hazard, it would be better to schedule another available instruction, this callback should return true. Reimplemented in llvm::HexagonHazardRecognizer, and llvm::PPCDispatchGroupSBHazardRecognizer. Definition at line 95 of file ScheduleHazardRecognizer.h. MaxLookAhead - Indicate the number of cycles in the scoreboard state. Important to restore the state after backtracking. Additionally, MaxLookAhead=0 identifies a fake recognizer, allowing the client to bypass virtual calls. Currently the PostRA scheduler ignores it. Definition at line 31 of file ScheduleHazardRecognizer.h. Referenced by llvm::GCNHazardRecognizer::GCNHazardRecognizer(), getMaxLookAhead(), and llvm::ScoreboardHazardRecognizer::ScoreboardHazardRecognizer().